The three threats to animal wastewater lagoons are gas emissions, pathogen propagation, and odor. The Saturn Disc Aquatic Float is a versatile solution that not only resolves these threats, but is also environmentally friendly and recyclable. Gas Emissions - The Saturn Disc Aquatic Float reduces gas emissions by 95%. This is not only environmentally friendly, but safety is increased by not releasing hazardous gases such as ammonia (NH3), methane (CH4), and hydrogen sulfide (H2S) into the atmosphere. Contaminant and Pathogen Propagation - There are more than 150 pathogens found in manure lagoons including Cryptosporidium and E. coli. It is important to contain these dangerous pathogens by shielding the surface of the lagoon. The Saturn Disc Aquatic Float offers superior wind resistance and surface coverage which means that these pathogens will not be carried by the wind through debris. Odor - Animal wastewater lagoons are known to produce strong ambient odors through its emissions of hydrogen sulfide gas and the decomposition of organic matter. Not only are these odors unpleasant, but they represent substantial risks to society including increased cases of asthma. Odors from CAFO (Concentrated Animal Feeding Operations) can be smelled from as far as 5 or 6 miles away, although 3 miles is more common. Ammonia - In the United States, 80 percent of ammonia emissions come from livestock production. A lagoon can vaporize up to 80 percent of its nitrogen through the reaction: NH4+-N -> NH3 + H+. As pH or temperature increases, so does the amount of volatilized ammonia. Once ammonia has been volatilized, it can travel as far as 300 miles, and at closer ranges it is a respiratory irritant. Acidification and eutrophication of the ecosystem surrounding the lagoons could be caused by prolonged exposure to volatilized ammonia. This volatilized ammonia has been implicated in widespread ecological damage in Europe and is of growing concern for the United States. Hydrogen sulfide - With averages greater than 30ppb, lagoons have high concentration of hydrogen sulfide, which is highly toxic. A study by the Minnesota Pollution Control Agency has found that concentrations of Hydrogen sulfide near lagoons have exceeded the state standard, even as far away as 4.9 miles. Hydrogen sulfide is recognizable for its unpleasant rotten-egg odor. Because hydrogen sulfide is heavier than air, it tends to linger around lagoons even after ventilation. Methane - Methane is an odorless, tasteless, colorless gas, which is fatal at high levels. Lagoons produce about 2,300,000 metric tonnes per year, with around 40 percent of this number coming from swine lagoons. Methane is combustible at high temperatures and explosions and fires are a real threat at, or near, lagoons. Additionally, methane is a potent greenhouse gas. The U.S. EPA estimated that 13 percent of all the methane emissions came from livestock manure in 1998, and this number has grown in recent years. 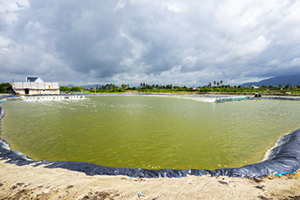 Animal wastewater lagoons are known to produce strong ambient odors through its emissions of hydrogen sulfide gas and the decomposition of organic matter. Not only are these odors unpleasant, but they represent substantial risks to society including increased cases of asthma. Odors from CAFO (Concentrated Animal Feeding Operations) can be smelled from as far as 5 or 6 miles away, although 3 miles is more common. There are more than 150 pathogens found in manure lagoons including Cryptosporidium and E. coli. It is important to contain these dangerous pathogens by shielding the surface of the lagoon. The Saturn Disk Aquatic Float offers superior wind resistance and surface coverage which means that these pathogens will not be carried by the wind through debris. The Saturn Disc Aquatic Float reduces the emission of greenhouse gases such as methane, resulting in a GREENER, more sustainable tomorrow. The Saturn Disc Aquatic Float is fully RECYCLABLE and REUSABLE! Depending on the condition of the floats, they can be 100% recycled. They can also be used in short-term applications since the floats are easily removable and transportable.